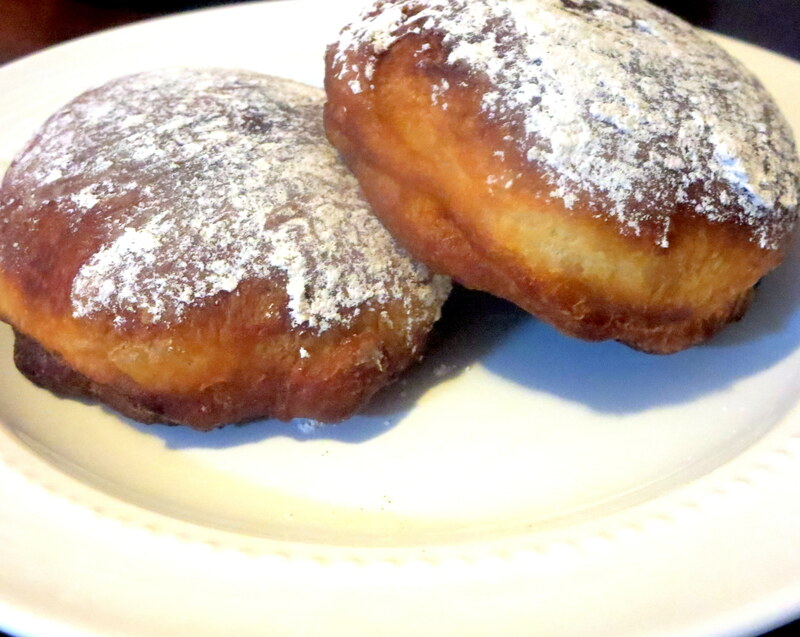 Sufganiyot, Israeli doughnuts, are a traditional Hanukkah treat. 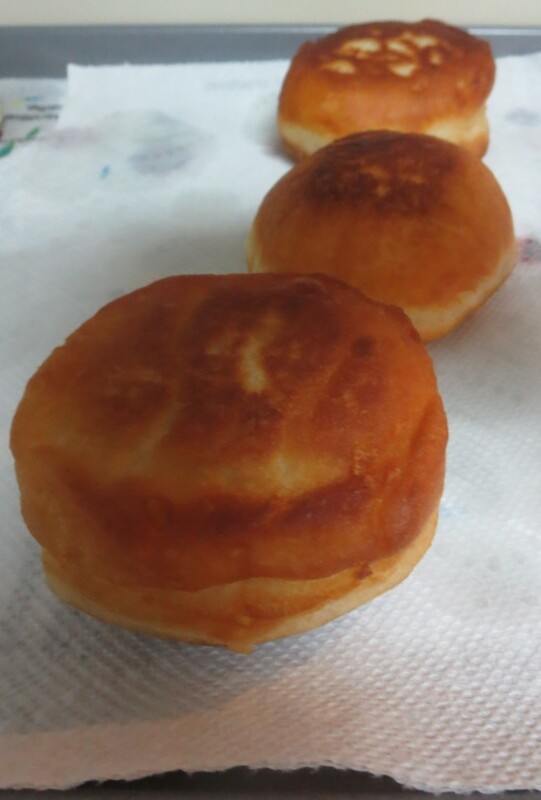 Fried and filled with jelly, they remind us of the miracle of the Temple oil. This year, since Hanukkah coincides with Thanksgiving, we came up with two delicious Thanksgivukkah doughnuts: Hazelgelt Sufganiyot and Maple Bourbon Pecan Sufganiyot. We used refrigerator biscuits to make these delicious desserts as easy to prepare as possible, but you can also substitute a homemade dough if you’re feeling ambitious. 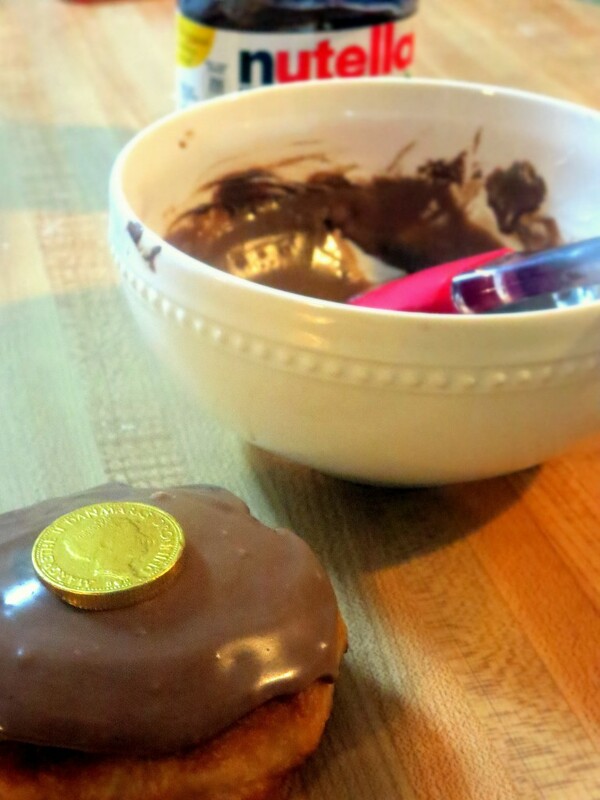 These doughnuts marry two of our favorite things- Hanukkah gelt and Chocolate Hazelnut spread. Whisk 1/2 cup of powdered sugar and 1 tablespoon of milk together until smooth. Stir in 2 tablespoons of Nutella. Set aside until ready to glaze doughnuts. Line a baking sheet with paper towels for draining. Heat 2 inches of oil over moderate heat in a heavy pan to 350 degrees F. While oil is heating, open the can of refrigerator biscuits and separate them. Divide biscuit in half and stretch out dough. Place one heaping teaspoon of Nutella on one half, cover with remaining half, and firmly pinch the ends to seal the doughnut. Fry doughnuts until golden, about 2-3 minutes per side. Drain on paper towels. Dip doughnuts in the Nutella Glaze and top with gelt! These flavors scream Thanksgiving and the easy homemade filling comes together in a jiffy. Everyone will be fighting over these! Don’t have bourbon? Substitute milk or almond milk. Whisk bourbon, salt and cornstarch together until smooth. Heat bourbon mixture and maple syrup in a small saucepan over medium high heat until bubbling, whisking constantly. Once the mixture has thickened and begins pulling away from the sides of the pot, take the pot of the heat. Stir in vanilla and toasted pecans. Set aside to cool. Combine powdered sugar and cinnamon together until well incorporated. Line a baking sheet with paper towels for draining. Heat 2 inches of oil over moderate heat in a heavy pan to 350 degrees F. While oil is heating, open the can of refrigerator biscuits and separate them. Divide biscuit in half and stretch out dough. Place one heaping teaspoon of filling on one half, cover with remaining half, and firmly pinch the ends to seal the doughnut. Fry doughnuts until golden, about 2-3 minutes per side. Drain on paper towels. Roll doughnuts in Cinnamon Sugar Topping. 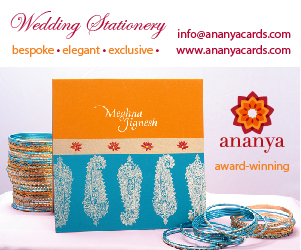 Share & enjoy!! This entry was posted in Holidays and tagged hanukkah, recipes, Thanksgivukkah.